Post-doctoral position for three years associated with the MAGIC telescopes at the Instituto de Astrofísica de Canarias (IAC). Post-doctoral position for two-year postdoctoral position to work on AMS. Post-doctoral position in High-Energy Gamma-Ray Astrophysics. 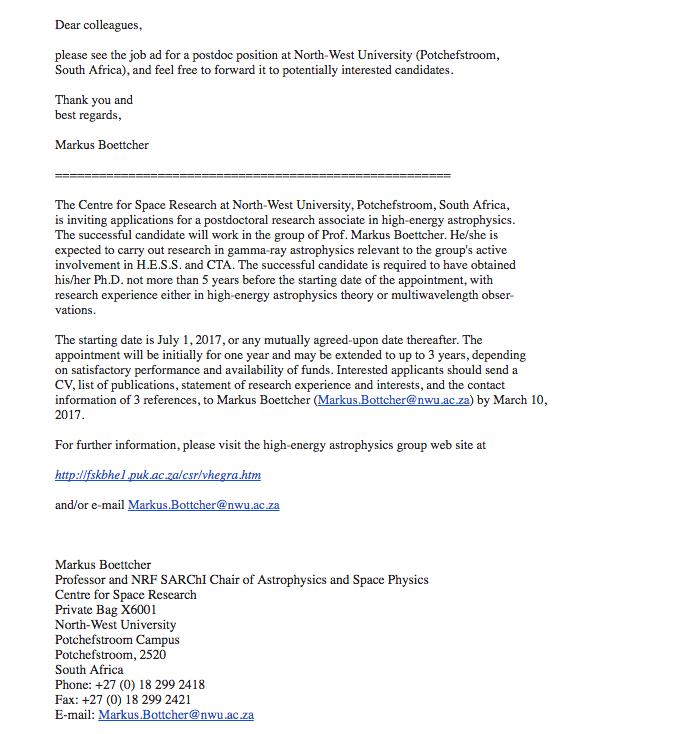 Post-doctoral position at the MAGIC TELESCOPE SITE. Postdoctoral Positions in High Energy Theoretical and Observational Astrophysics, INSPIRE. Post-doctoral position on extragalactic transients with the Cherenkov project and the H.E.S.S. experiment. Posición postdoctoral en Física Teórica/Experimental. U. Católica, Chile. DESY in Zeuthen has an opening for a postdoc in theoretical astroparticle physics.